Yay yay yay, the Kentucky Derby is here! And you know what THAT means. Right, horses and mint juleps, but also FASHION! Normally we’re here freaking out about hats. (And it’s like our once a year chance to celebrate outrageous headwear without people side-eyeing us, so just GIVE US THIS, okay?) But today we are all about the Derby SUITS. Specifically, the powder blue tulip suits that were on glorious display at the Kentucky Derby. Here it is, just as marvelous from the back. No, seriously, all the guys who know what’s what were wearing these suits at the Kentucky Derby. 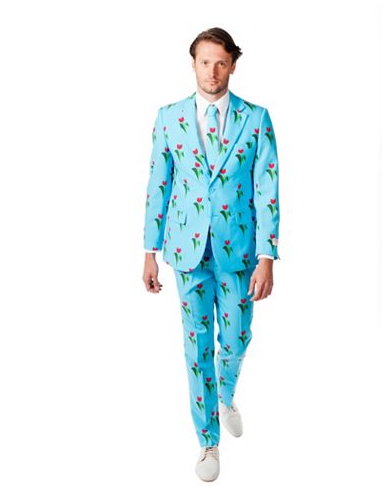 This suit is a pastel blue vision, which is why were are REALLY nervous about this tulip-suited guy carrying a beer AND a chocolate ice cream cone. Be careful, you oh-so-fashionable man! We haven’t even talked about the matching tie, yet. You guys, THE MATCHING TIE!!! So where does one get ones hands on this suit of such great beauty? It must be, like, a fancy pants designer who makes this and the suit must set you back like a bajillion and a half dollars, right? RIGHT? WRONG. Kohl’s, YES KOHL’S, makes this suit, and it’s 99 bucks ,which is NOTHING for a suit – especially a suit this freaking cool. FYI the Kohl’s Men’s OppoSuits Slim-Fit Novelty Pattern Suit and Tie Collection also comes in a poker chips and playing cards pattern, camouflage, dollar bills, red white and blue stars and stripes, and a palm trees and ocean view pattern. A quick glance around the website turned up no results for Ladies’ Novelty Suits. Kohl’s! DUDES! Get on it! Tulip suits for everyone!